Ground Zero Mosque Modeled after Notorious 9/11 Mosque? Jamal Barzinji is a Muslim Arab-American businessman associated with numerous Islamic organizations. He holds a bachelor's degree in chemical engineering & fuel technology from the University of Sheffield, England (1962), and a master's degree and Ph.D. in chemical engineering from Louisiana State University (1974). Barzinji is best known as a founding father of the U.S. Muslim Brotherhood and currently serves as vice president of the International Institute of Islamic Thought (IIIT), which he co-founded in 1981. A federal court affidavit alleges that Barzinji is “closely associated” with the terrorist groups Palestinian Islamic Jihad (PIJ) and Hamas. That affidavit cites Barzinji's ties to Sami al-Arian, a Muslim Brotherhood member who secretly led PIJ's North American operations. In 1959 Barzinji played a role in founding the Muslim Student Society of the United Kingdom and Northern Ireland. In 1972 he served as president of the Muslim Students Association of the U.S. and Canada. In 1973 he was the founding general manager of the North American Islamic Trust. Barzinji also has been a board member of the Islamic Society of North America (ISNA); a member of ISNA's Majlis Al-Shura; a founding member of the International Charitable Foundation, the Association of Muslim Social Scientists of North America, and the Association of Muslim Scientists & Engineers; dean of the School of Islamic Revealed Knowledge & Human Sciences at the International Islamic University in Malaysia (1994-1998); a founding board member of the Center for the Study of Islam & Democracy; and an officer with the World Assembly of Muslim Youth. 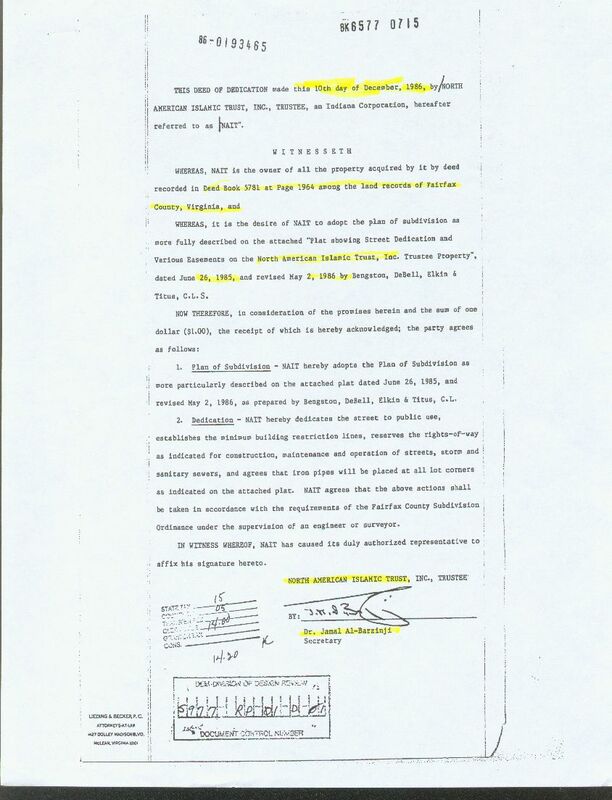 Further, Barzinji has worked for numerous educational, political, charitable, and business organizations such as Amana Mutual Funds, Mar-Jac Poultry, Safa Trust, the SAAR Foundation, Bank Islam Malaysia, and Nada International; most of these groups were raided by federal agents in connection with terrorism-financing investigations. In 2003 Barzinji's own home was searched as part of those same probes. In 1991 Barzinji founded Dar al-Hijrah, a Falls Church, Virginia mosque whose construction was bankrolled with $5 million from the Saudi Embassy. Directly affiliated with the Muslim American Society, this jihad-promoting mosque, whose property deed bears Barzinji’s signature, is well known for its numerous close ties to Islamic terrorists and extremists, including members of Hamas and al Qaeda. Click here for details of these affiliations. Also in 2008, Barzinji donated $1,000 to Barack Obama's presidential campaign. Two years later, he contributed $950 to the congressional campaign of Democratic Representative Keith Ellison of Minnesota. In 2010 Barzinji became one of a number of partners who helped promote Feisal Abdul Rauf's Cordoba Initiative, which sought to build a 13-story, $100 million mosque/Islamic Center just 600 feet from Ground Zero in lower Manhattan.